All over the world, art historians’ minds are divided concerning a recent discovery in Florence’s Palazzo Vecchio. The main hall, covered in sixteenth-century frescos by Giorgio Vasari, appears to hide a Leonardo da Vinci painting beneath, raising the question of how – and whether – to uncover the hidden artwork. ECLA Faculty member Professor Aya Soika was one of those experts consulted on the controversy. On the AY/BA1 trip to Florence, ECLA students had the opportunity to listen to the views of Federico Berti, an art historian and Florentine native—as well as a longstanding friend of ECLA–who strongly supports the work of uncovering the ‘hidden’ painting.When the issue first emerged, Federico himself was rather dubious of the uncovering project supported by National Geographic, but as he got more involved his mindset changed. “Parts of the Vasari have to be restored anyway,” he explained, and similar restoration work was already done on one of the frescoes on a different wall back in 1982. “With modern technical equipment and knowledge, it would even be possible to remove and put back the Vasari without leaving any traces,” he claims, as Vasari’s fresco is on a ‘fake’ wall, behind which Leonardo’s painting is thought to lie. Several old chronicles have been found describing the painting and its location, but their accounts differ: at first it had been thought that Leonardo’s painting was hidden on the other side of the hall. According to Federico, there are more and more indicators that this painting is really hidden behind Vasari’s fresco, as the pigment of the oil colour Leonardo would have used has been found by Maurizio Seracini and his team of researchers. 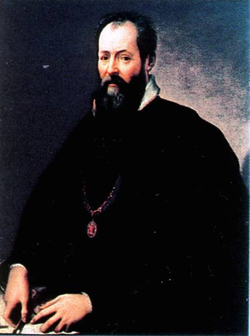 However, he disputes the idea that a certain mysterious banner on the fresco, which says, “cerca trova” (“he who seeks, finds”) is a deliberately placed indicator by Vasari, as some conspiracy theorists believe it to be. At this very moment, the team is waiting for the ministry’s permission to continue their research, after a petition signed by 500 art historians demanding that the fresco be left untouched brought their project to a halt a few weeks ago. If all goes well, we will soon be able to reveal what lies hidden behind, and get a glimpse of what happened in the salon in the years before Giorgi Vasari was finally commissioned to decorate it the way we are used to seeing it today.